- Paintball oppsto i USA en gang på syttitallet. Paintball er derfor en relativ ny, actionpreget lagsport, der to lag spiller mot hverandre på en bane. Spillet kan varieres i det uendelige, fra lek i skogsterreng til turneringsspill på profesjonelt nivå. - Hovedelementene i spillet er at i hvert av de to lagenes startpunkt, henger det et flagg. Lagets mål er i løpet av en begrenset mengde tid, ta flagget til motstanderen og føre det tilbake til eget startpunkt. Ut over dette finnes det en rekka alternative spillmåter, her er det egentlig bare fantasien som setter begrensninger. - Markøren skyter ved hjelp av drivgass en liten gelatin-ball, på størrelse med en klinkekule. Ballen er fylt med et vannløselig fargestoff, kalt "maling" / ”paint” – derav navnet ”paintball”. Dersom en spiller blir truffet av en slik "maling-ball", uansett hvor, er denne spilleren markert og ute er av spillet. - Det er først det siste årene at paintball virkelig har begynt å "ta helt av" i Norge, men vi har fortsatt et lite stykke igjen for å nå nivået i våre to naboland, Danmark og Sverige. I Danmark har Paintball siden 1996 vært representert av sitt landsdekkende forbund DPF (Danish Paintball Federation). - I Norge finnes det i dag et over hundrede mer eller mindre seriøse lag, som spiller regelmessig på alle kanter av Norge, i tillegg til disse finnes det mengder av kameratgjenger som spiller for å ha det moro og komme ut i frisk luft i helger og ettermiddager. Noen har også organisert seg som klubber rundt om i landet, noe som er meget positivt med tanke på å få dannet et landsdekkende forbund. Det arrangeres flere turneringer i løpet av året rundt om i landet, selv om disse tidligere har hatt en tendens til å finne sted stort sett på sør-øst landet, ser det nå ut til å være flere som melder interesse for å arrangere turneringer andre steder i landet, nevner som eksempel Bergen, Stavanger, Trondheim, Tromsø. - Team-work er svært viktig, og gruppen får anledning til å teste sin evne til samarbeid og å ta raske beslutninger i stressede situasjoner. I utlandet, bl.a. England, blir paintball regelmessig benyttet i forbindelse med lederutviklingskurs. I USA er paintball den klart hurtigst voksende "idrett"; med sponsorer, TV-dekning, profesjonelle utøvere og nasjonale mesterskap. - Det beste med Paintball er at det er en lek for alle, uansett kjønn eller alder. Spillene kan legges opp slik at alle får delta like mye, og har like store sjanser uansett markør, erfaring eller fysiske forutsetninger. - Så hvis du kunne tenke deg å begynne med denne "adrenalin-kickende" sporten, eller allerede har blitt hekta, ta kontakt med oss i paintball utleie. Ønsker du å linke ditt paintball nettsted til oss, setter vi meget pris på dette. Under finner du noen banner som du benytte til dette. Dette banner kan fritt benyttes. from Alex Spence on Vimeo. "...We have put together a brief history of paintball so you can get to know your roots in the sport you love and so you are fully loaded with fact ammo when you are chatting to your mates down the pub. The guys here at We Are Paintball have been in the sport since it arrived in the UK so you can count on us giving you the stuff you didn’t know you needed to know? We have added the original birth rights from the states and how it all started over there and how it moved to the UK. The humble paintball was invented by a man called Charlie Nelson who co-founded The Nelson Paint Company. The Nelson Paint Company started in 1940 which originally served the forestry market by manufacturing tree-marking paints. Faced with the challenge of marking trees in hard to reach places, Charles Nelson invented a paint pellet that could be shot out of a gun. Originally the paintball was made from oil base paint in order to leave a permanent mark on the tree. Foresters marked trees with it, cattle ranchers marked livestock with it and eventually people started shooting each other with it. As the pellet marking game became a more regularly played, Charlie was asked about creating a less permanent type of paint for the pellets which led onto the water based ball being born. Nelson was not solely responsible for the invention of paintball; credit can be given to Charles Gaines, Hayes Noel and Bob Gurnsey who originally used the tree marking guns in a sort of survival game. The game they played was the first organised recorded game with people shooting paintballs at each other; although somewhat different to the modern game we play today. Bob Gurnsey first marketed paintball as a game of capture the flag using the cattle marking pistols which built the foundations of the game we play today. Founding National Survival Games (NSG) he had the first paintball guns created specifically for this new game. Since the earliest paintball guns were founded the designs have since evolved into markers that include some of the worlds most cutting edge technology. The early paintball markers were powered by CO2 cartridges similar to many of today’s markers but suffered from poor range and accuracy. 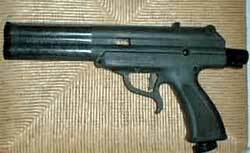 The first paint gun that people starting playing actual paintball games with, was the Nel-Spot 007 pistol. James Hale of Daisy Manufacturing invented the design in 1970, but the production of these paintball guns was carried out by Nelson Paintball Company. The original pistols used for marking trees had to be modified as the velocity was too high to use with humans which gave way to the first paintball gun being manufactured specifically for the sport of paintball; this gun was the now legendary Splatmaster, which was patented in 1985. The Splatmaster was a pistol made entirely of plastic and had to be cocked by pressing the back of the gun each time you wanted to fire a shot. After the success of the Splatmaster, Nelson began manufacturing their paintball guns with pump action attachments and interchangeable barrels. The biggest change in paintball came when Dennis Tippmann designed a gun called SMG60 which was a fully automatic paintball gun. Tippmann Pneumatics was originally called the Tippmann Arms Company, and produced replicas of military weaponry for reenactments. The next design to come from the Tippmann factory was called the 68-Special, which featured the first hopper, before this paintballs were fed into the gun by a tube or in the case of the SMG60, belt fed! 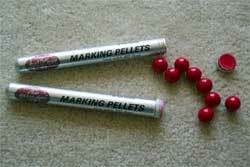 The first electro-pneumatic paintball gun was marketed by Smart Parts in 1995 known as the Shocker. Generally, electros work on lower air pressure than mechanical paintball guns, and the release of air is precisely controlled by electronic valves. This low-pressure operation and efficiency has become the new standard that even mechanical “blow-back” and “blow-forward” paintball guns are trying to mimic. Paintball guns will continue to evolve and reach new levels of performance. Check out our Paint Gun Museum for a more in depth look at how things have changed. Originally the phrase Skirmishing was coined through the Skirmish network being the most successful operation in the UK. However as time progressed the likes of National Survival Game, California Commando and Simulated Activities expanded rapidly with their own takes on the game and the name paintball reaffirmed itself. The difficulty for Skirmish in the early days was their site guns (the now defunked Daystates) used a smaller .62 paintball which was not compatible with the rest of the industry that used the larger .68. It would be fair to say that the .68 format was the better paintball and under commercial pressure Skirmish later followed suit. It is estimated that there are up to 400 paintball sites now just in the UK. The level of service is one of the biggest changes since the early 80’s with venues offering full restaurant style catering, games zones that wouldn’t look out of place in any major theme park and state of the art equipment as standard. A far cry from the standard issue goggles that didn’t cover your mouth or nose. During 1991 Paintball crossed the channel to France and Belgium and now paintball venues can be found in Australia, Denmark, France, Holland, Germany, Austria, Ireland, Belgium, Greece, Italy, Norway, Sweden, Africa, Russia, New Zealand, Brazil, Venezuela, Israel, Korea, Thailand and the Philippines. In the UK the sport has gone through many transitions and has changed its look dramatically to suit either political or player trends. The Walk on player, now know as Scenario player was considered by most to be a uncool or untrendy, whilst the paintball sites also didn’t want to cater for this type of player. For nearly 10 years British paintball has predominantly been a rental market with casual players turning up for a stag do or company do. At the other end of the scale is the tournament player, lavishly kitted out in bright colours playing tournaments with not a tree or bunker to be seen. The woodland player and the ‘walk on’ were phased out though political pressure and pressure from the industry because the war image was doing the sport no good. The fact remains that this important band of camo wearing players has left a gaping hole in our industry. The top end talent has been left with no gene pool to acquire new players into the world of professional paintball and the UK paintball retail industry has suffered because of it. The last year or two has seen dramatic change in the trends for paintball with the camo image firmly coming back and scenario players returning to the sport of paintball. Others see this as a dangerous area for our sport and it can be argued that there is a risk in this new trend, due to the many of the guns replicating real weapons. However the industry is enjoying a new lease of life in this middle ground and it has claimed back much needed business from the growing Airsoft market....."